Another fantastic free motion quilting design to learn how to quilt is Pebbling, also sometimes called Pebbles. This is a beautiful stacking design created by stitching simple circular shapes together to create an eye-catching texture for your quilts. In this quilting tutorial, I quilted Pebbling first on my home machine, a Bernina 1230, then on a Grace Qnique longarm on the Continuum Frame. Click Here to learn more about the Grace Qnique. Of all the quilting textures we have available to us, Pebbling is the most intense and dynamic of designs you can quilt. It adds a texture to your quilt that's just plain luscious. Pebbling involves a lot of travel stitching, or stitching back over another line of quilting. This makes the design stand out boldly on the quilt so you can see Pebbling from a distance. This makes Pebbling a great design to use in wall hangings, art quilts, and show quilts where you want a real punch of texture and impact so the best areas of your quilt will stand out. Pebbling was the perfect design to quilt around this delicate snowflake motif. It makes you want to touch the quilt to feel the texture of the circles on the fabric. The downside of Pebbling is it can be time consuming to quilt. On a home machine, I tend to get very picky about stacking the circular shapes tightly together so the edges touch. No matter how you quilt the circles, whether it's a figure eight motion or swinging around the circles one by one, you will have to travel stitch quite a lot to form this design. For this reason, Pebbles aren't a great choice to quilt over an entire quilt - it will just take too much time! Instead use this free motion quilting design with other designs as an accent, not the main event. It's a great choice for quilt blocks as you can fill only the single square, not the entire quilt. If you quilt Pebbling in the sashing of a quilt, it will create an interesting frame for your quilt blocks and won't take a million years to finish the quilt project. There are two variations of Pebbling I shared in the video: Filled Pebbling and Underwater Rocks. When you're going for maximum impact and drama, Filled Pebbling is a great choice because it takes the travel stitching and thread play up a notch to make the design stand out even more on your quilt. For this design, quilt inside all the tiny triangular shaped gaps that are left between the circles and fill in the spaces completely. You'll want to use a contrasting thread because this will take some time and you'll definitely want credit for it! I love quilting the center circles of Dresden Plate Quilt Blocks with Filled Pebbles because it gives the block that extra punch of pretty thread and texture. If Pebbling feels super slow and tedious and you're struggling to form smooth, circular shapes, then it sounds like Underwater Rocks will be the perfect design for you to try. This design is intentionally messy as you quilt the circular shape around three times before moving to the next circle. This is very helpful to just master the circular movement of Pebbles and take the perfection factor down a notch. When you can't quilt it clean, make it intentionally messy! When quilting on a home machine, it's honestly easier to quilt Pebbles small. The smaller the circular shapes, the smaller the movement of your hands and you're more likely to move the quilt smoothly and not end up with a weird amoeba shape instead of a circle. It's hard to quilt larger Pebbling on a home machine because you have to swing the quilt around to form the circle and you'll be limited by the size and weight of the quilt on the machine and how wide your hands are spaced apart. It's very hard to stop and reposition the quilt and your hands without creating noticeable wobbles to the circle. If you find this happening, shrink the size of your Pebbles down so you can quilt the shapes with one continuous movement rather than having to stop and reposition the quilt. Quilting Pebbling on a longarm machine on a frame felt much easier and I know I could make the circles any size or shape I wanted, within the limits of the open space on my frame. However, it feels much harder to travel stitch cleanly and maintain control over the machine. As you swing the heavy machine around, inertia will continue to pull it in that direction and you have to hang onto it and not let it swing out of control. While it may not be as easy to quilt Pebbling, Underwater Rocks felt very easy and really helped me practice controlling the speed of the machine and forming the circular shapes. The real key to mastering any quilting design is to quilt it over an entire quilt. Take a quilt top you've pieced, but aren't in love with and cover it completely with Pebbling. It might end up a little stiff so you can always cut it up to make a purse, stuffed animal, or pillow afterward. By the time you finish quilting that project, you will have Pebbles down pat and be ready to learn a new quilting design! Did you enjoy this quilting tutorial for pebbling? If you enjoyed this video, you'll love taking a class with me online! 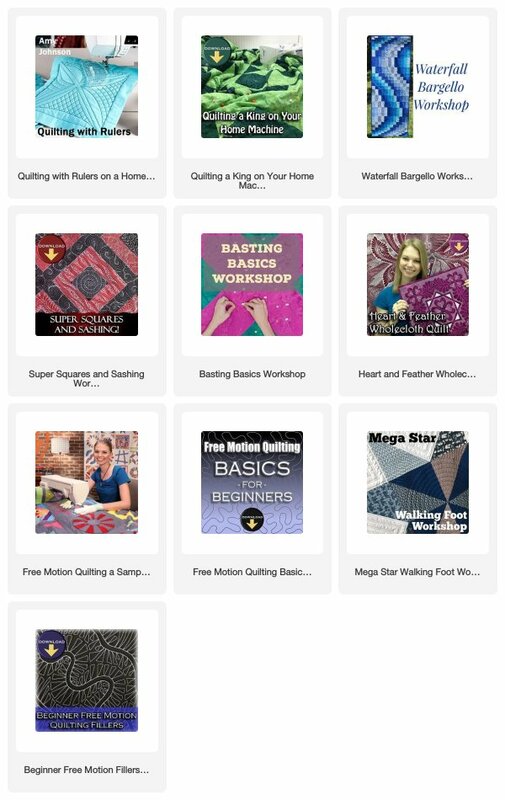 All of our quilting workshops include step-by-step videos, beautiful photos and diagrams, and clear instructions organized together in a downloadable PDF file. I can't wait to teach you more about quilting! If you're just beginning your quilting journey, the best quilting workshop to take just to get started is the Mega Star Walking Foot Workshop. This online class covers all the basics from squaring and cutting your fabric, to piecing the giant star quilt. We then quilt it together with three designs using walking foot quilting, the best style of quilting for beginning quilters! I enjoyed making this class because it was a challenge to quilt this large throw sized quilt on my home machine. I used soft minky fabric on the back of the quilt and learned a lot about how this changed the feel of quilting and my quilting designs. This is now my favorite quilt to snuggle up with my son on the couch. Click Here to learn more about the Mega Star Walking Foot Workshop. P.S. If you use the discount code * Pebble, you'll save 10% on your next order over $20 from our quilt shop! Thank you for helping to support our family and small quilting business with your order! * Does not apply to Affordable Sewing Tables and Inserts, machines, and drop ship foot sets.